Production will be limited to 19 units. Last week, Hispano Suiza revealed its new supercar: the . Due to enter production later this year, the Maguari is powered by the Lamborghini Huracan’s twin-turbo V10 and produces over 1,000 hp. This isn’t the only model that will revive the Hispano Suiza name, however. While the Maguari is being produced by a company called Hispano Suiza Automobilmanufaktur AG, another company called Hispano Suiza Cars is . Both companies claim to own the rights to the Hispano Suiza name and both models will be displayed at the 2019 Geneva Motor Show. Ahead of its debut next week, the Carmen’s striking design has been previewed in a new teaser image, giving us a top-down view of the supercar. The company says the Carmen is heavily influenced by the 1938 Hispano Suiza H6C Dubonnet Xenia commissioned by World War One fighter pilot André Dubonnet. 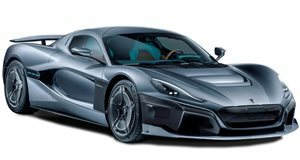 According to the company, the Carmen’s face is dominated by a large chrome-framed, deep-set trapezoidal grille, and will also feature circular headlights and a "floating” front splitter. The company also claims the Carmen has a drag coefficient of 0.325. Two electric motors power the Carmen, with one on each 20-inch rear wheel. This setup provides a combined output of 1,005 hp, enabling the electric supercar to accelerate from 0-62 mph in less than three seconds before hitting a limited top speed of 155 mph. Thanks to its lightweight carbon fiber monocoque chassis, the Carmen tips the scales at 3,726 lbs. It uses a large lithium-ion polymer battery pack with a capacity of 80 kWh, but the company says this could be upgraded to a larger 105-kWh battery next year when the car gets closer to production. This could provide a range of over 248 miles between charges. Open the scissor doors, and you’ll be greeted with an interior that is heavily inspired by classic Hispano Suiza models. Retro-inspired touches include an analogue clock, wood veneers and toggle switchgear. There will also be machined aluminum and a triangular gear selector as a homage to the "art deco steel triangle” used on a number of classic models. There are plenty of modern touches too, however, including two carbon composite seats covered in leather and Alcantara upholstery, LED ambient lighting, a wireless smartphone charger and a 10.1-inch touchscreen infotainment system with Android Auto and Apple CarPlay. Production of the Carmen will be limited to 19 units, with prices starting at $1.7 million. The company is currently accepting orders and the first deliveries are slated to begin in June 2020.